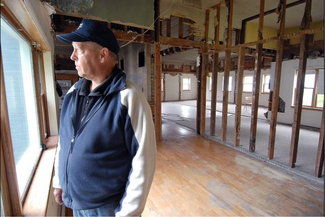 Zeeland Historical Society Manager Kit Karsten stands inside the old New Groningen schoolhouse, which is currently undergoing restoration to its original apperance. The schoolhouse, built in 1881, served as a private residence from 1951 to 2006. Philo Riemersma was born in Zeeland 83 years ago. From kindergarten through eighth grade, he attended the old New Groningen School on Paw Paw Drive in Holland Township. "Back then, the teachers were pretty strict. Once in a while, it was the hickory stick. I remember one or two times someone went down to the basement for a paddling," Riemersma recalled, but he wouldn't say whether he was ever on the wrong end of the stick. The two-room brick schoolhouse - not to be confused with the current New Groningen Elementary School at 10542 Chicago Drive - was built in 1882 and closed in 1951 when it was converted into a residential duplex. Since purchasing the historic building in 2006, the Zeeland Historical Society has been trying to raise money to renovate it into a living museum and community center. Half of the school will be restored to its 1880s schoolhouse look, and the other half will be converted into a meeting room, said society Manager Kit Karsten. After raising $155,000 to buy the property from private owners, the group has raised an additional $80,000 to $85,000 out of a restoration budget of $400,000 to $450,000, said society member Amy Langeland. The society thinks it has enough money to complete most of the exterior work, which it hopes to start in the spring. “We’ve got quite a ways to go to raise funds, but if we got the exterior work started, that would show people that we’re serious and something’s happening and maybe more money would come along,” said society board member Chris Penning. While plans for both rooms include retaining the original tin ceilings and hardwood floors, one room will be restored into an 1880-to-1920-era school room which local schools can use to teach a class for a day in the style of an early American period. “A teacher would be able to take a whole class. It will be used for interactive history for kids. They’ll actually be able to sit at the (original) desks and write on the chalkboard,” Langeland said. The other room will retain its vintage look and feel, but would be used for society workshops and potentially be available for use by outside groups. Langeland said grants have come from a variety of sources including school alumni now living in other states, the Community Foundation of the Holland/Zeeland Area, Zeeland Board of Public Works, the city of Zeeland, Zeeland and Holland townships, and a number of corporate foundations. The building’s exterior is Veneklaasen brick from a now-defunct local brickyard used in many historic downtown Holland homes and Hope College’s Van Vleck Hall. “The school was about half a mile from the brickyard,” Karsten said. “There was a huge drive from the Veneklaasen family. The family approached us and contacted their family across the United States. About $10,000 to $15,000 came from that family,” Langeland said. “There’s nothing that specifically targets the Veneklaasen architecture in the area, so we saved a Veneklaasen building,” she added. Last year, the society received a one-of-a-kind gift. Riemersma said he was born and raised on his father’s farm, a “stone’s throw” from the school. “I was one of the fortunate ones — I could run home at noon for lunch. Most of the kids were from out in the country. There was no pop or juice — they just had water. We didn’t have any indoor plumbing. We had two outhouses behind the school — a boys and a girls — and we had a pump in front of the school for water,” he recalled. Riemersma said the smaller room held the K-4 class, and the bigger room grades 5-8, with about 10 students per grade on average, resulting in 40 students and one teacher per room. He graduated from the eighth grade at the schoolhouse in 1938. The Zeeland octogenarian said he supports efforts to restore the historic site, and even helped tear down some of the walls earlier this year. “I’d like to see them get it done. I’d sure like to see the bell tower go up,” he added.